This primer outlines key concepts that have shaped permaculture principles and practices over more than four decades. RetroSuburbia builds on those same understandings, refined over time and focused on the prospects for the ‘lucky country’ over the 21st century, without going into all the technical detail or debates. For those interested in understanding future prospects in suburbia and beyond, this primer provides a framework for further reading to inform your retrosuburbian downshifting journey. ‘Energy descent’ is the erratic but on-going decline in the material and energy base supporting humanity2. 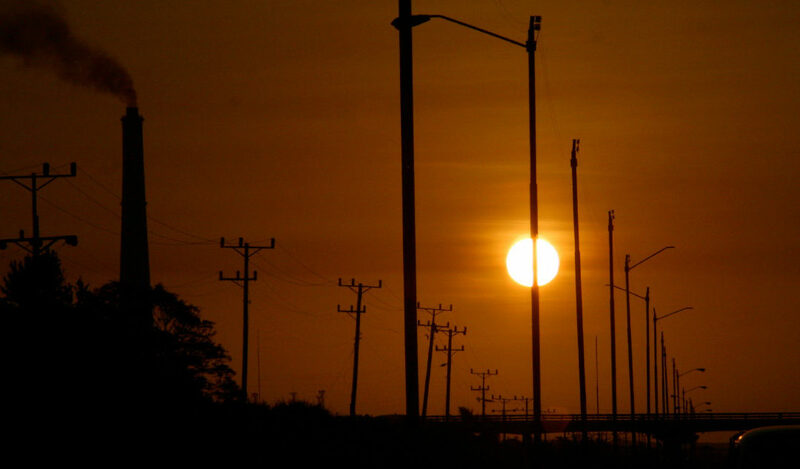 As high quality fossil fuels are depleted and the impacts of their past use continue (such as climate change), the nature of society will change to reflect many of the basic design principles, if not details, of pre-industrial societies that worked with less energy of lower quality. This will require a relocalisation of the economy, a re-ruralisation of settlements and, in many countries, a reduction in the population that can be sustained. Novel technologies and cultural innovations may ease the transition but not prevent the inexorable shift to less complex but more resilient ways to provide for needs and maintain human values. Economic contraction and a refocus to basics (eg food and fuel) will be the most obvious early symptom of energy descent while nonessentials, including overseas travel, will again become luxuries for most people. Self and collective reliance will grow because these economies do not depend on credit (that will be scarce or unavailable). There will be lots of downsides from unplanned contraction, but there could be many positives including greater family and community solidarity, stronger connection to nature, and improved fitness and mental health, as happened during the Second World War. Official modelling of the future by governments and global organisations assume continuous economic growth is necessary and inevitable. This requires high quality energy sources that are cheaper, more abundant and on-demand than fossil fuels that created industrial civilisation and currently support seven billion people. None of the heavily funded or more fringe energy sources appear able to replace, let alone better, the higher quality fossil fuels that are now largely exhausted. 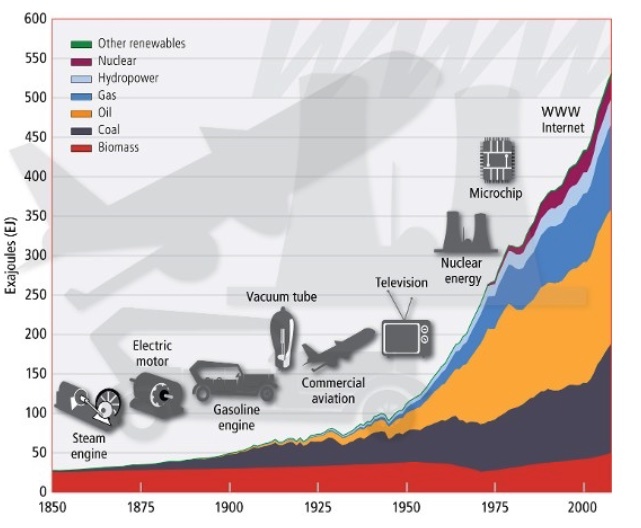 Even if one of the many worked on, or wished for, technological breakthroughs were to happen, the time required for global energy transitions (eg wood to coal, or coal to oil) typically take 50 to 100 years. 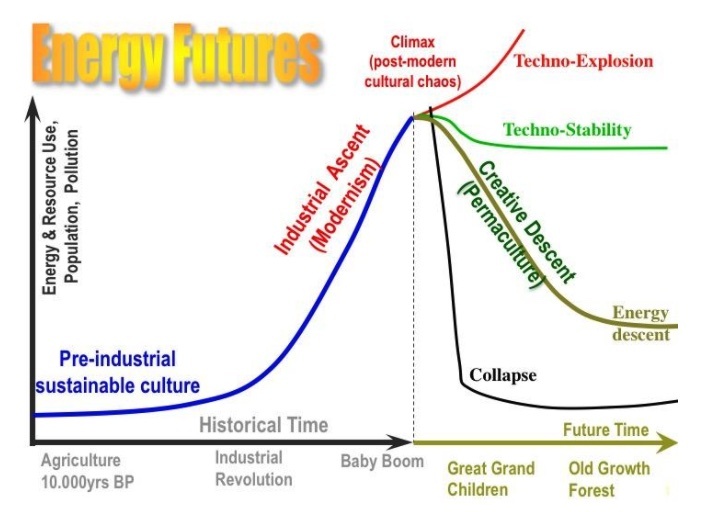 Time has run out for this default energy future that I call ‘techno explosion’. A world of run away global scale power and artificial intelligence would probably lead to Homo sapiens becoming redundant. Thank goodness future generations are likely to dodge that future! The net energy (energy profit after all the costs are accounted for) available from renewable and unconventional fossil fuels is a hotly debated subject in academia (after decades of neglect). If supercities floating in space and mining asteroids for metals are out of the question, could novel energy sources maintain what we have, as suggested by the last, hopeful run of the ‘World 3’ model in the Limits to Growth report? Unfortunately, that run of the model assumed global alignment around sustainability policies in the 1970s. The baby boom generation in affluent countries need to apologise for failing future generations on that one. Mainstream sustainability programs assume humanity can still achieve this while we cease using fossil fuels over the next two decades (in the slim hope of avoiding more dangerous climate change). They suggest the continued dominance of urban living, albeit in smaller but higher density cities, with less meat consumption and travel. This ‘techno stability’ future would require high-efficiency manufacturing based on recycling of all critical materials and a steady-state economy, including reform of the debt-based money system that requires growth to avoid collapse. Reductions in economic inequities, significant enough to stop the ‘have nots’ wreaking it for the ‘haves’, as well as end to the resource-wasting arms race and superpower rivalries, and proxy wars more generally, are simultaneously necessary, not for utopia, but to stave off energy descent or collapse. This seems like a tall order to say the least. If neither ‘techno explosion’ nor ‘techno stability’ is realistic, most people assume some type of catastrophic ‘collapse’ where population falls precipitously and humanity loses all the benefits of civilisation. Mainstream climate science is now articulating this as the default future for humanity, if greenhouse gas emissions do not fall rapidly to a fraction of the current level over the next few decades. The idea of total collapse or Armageddon has been an alternative story about the future built into Christian civilisation for two thousand years. In facing the limits to growth, few people consider the historical and other evidence suggesting energy descent futures. Once we accept the likelihood of energy descent futures, then a myriad of constructive opportunities for a ‘prosperous way down’ look possible, and permaculture suddenly makes sense as something more than a cool form of organic gardening. ‘Brown Tech’ results from a slow decline in conventional oil production post-peak combined with a rapid onset of climate change. It is characterised by economic, ecological and geopolitical crises with strong government action to take control of the economy and society. A parallel feral economy is likely to thrive at the conceptual and geographic fringes. My essay ‘Crash on demand; welcome to the brown tech’ suggests we are heading into this scenario and that sub-scenarios including Property Bubble Burst, Geopolitical Oil Supply Shock, Extreme Weather Events and Agricultural Collapse (in some regions) could be the crises that establish the new reality. The wild card in all Brown Tech scenarios is the degree to which large scale responses tend to lock in accelerating climate change or ameliorate it. RetroSuburbia is based on the assumption that Australia is heading into some version of the Brown Tech scenario. ‘Green Tech’ is slow oil decline combined with relatively slow and modest onset of climate change. It is characterised by relatively robust regional and rural economies, greater distribution of power and decision making but harder times for most people especially in cities. The wild card in this scenario could be the degree to which regenerative agriculture methods including some associated with permaculture could compensate for the decline in oil and other non renewable resources to both sustain humanity and reverse climate change. RetroSuburbia assumes that aspects of the Green Tech scenario playing out could make regional towns a good future prospect. ‘Earth Steward’ results from rapid decline in oil production that triggers a global economic collapse severe enough to rapidly reduce greenhouse gas emissions, thus saving the world from dangerous climate change. The severity of the economic and political collapse of nation states and global systems leads to a renewal of local culture and economy from industrial salvage and the regrowth and modest abundance from nature. The wild card in this scenario could be the global spread of an earth spirituality that resolves the ancient wars against nature, between the tribes and between the genders and allows humanity to overcome these limits to more benign futures. ‘Lifeboat’ results from a rapid decline of oil production with resulting economic collapse. However this occurs too late to avoid dangerous climate change as tipping points in the earth’s systems take over from human greenhouse gas emissions in exacerbating declines in agricultural production and natural disaster impacts. In this context, industrial salvage is a greater source of wealth and sustenance than grazing, forestry, hunting, beekeeping and garden farming. The wild card in this scenario could be a masculine warrior culture controlling mines, cities, ports and other places of concentrated resources and/or trading hubs. Since the decline of conventional oil production post peak (2005-2008) has been slow so far, RetroSuburbia assumes these more extreme scenarios (Earth Steward & Lifeboat) are much less likely prospects in the near term at least. Building on this basic scenarios framework, my short story ‘A history from the future’, set in Central Victoria, provides one plausible tale of how a Green Tech scenario could emerge over the next 20 years and be stable for decades more before it segues in a relatively benign way to an Earth Steward scenario after a peak and decline of climate change by 2050. In that story, those who pioneer retrosuburban living survive and thrive while building the models that contribute to the recovery of a sane and resilient society after the traumas of energy descent crises. John Michael Greer, author of The Long Descent (2008) has been the most prolific and influential writer about energy descent futures (see ecosophia.net). A direct transition to my Earth Steward or Lifeboat scenarios would be classified by most futurists as forms of ‘collapse’, while some futurists describe any decline as a ‘collapse’. 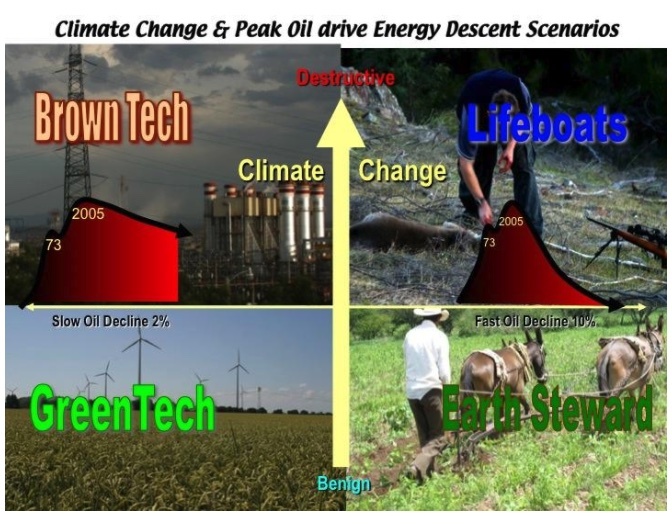 I include Earth Steward and Lifeboat as energy descent scenarios because I think the residual wealth from salvage and/or natural renewal could allow many aspects of civilisation (including modest technologies, literacy and local governance) to be maintained for some time before the depletion of the salvage economy leads to ongoing energy descent.